The Meon LiFe provides 12VDC power to ten 4-pin XLR outputs. Three outputs are rated to 9A and the remaining seven are rated to 5A. Each output has built-in overload and short-circuit protection. 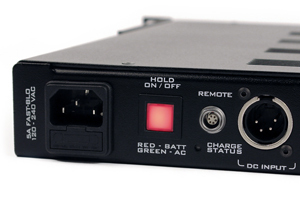 Since smartphones and tablets have become ubiquitous on set, the Meon LiFe is equipped with two 5VDC USB charging ports on the front panel. These ports are capable of providing up to 2A of charging current and are optimized to quickly charge Apple devices. If AC power is ever interrupted, the Meon LiFe seamlessly switches to its internal 20 Amp-hour Lithium Iron Phosphate (LiFePO4) battery. 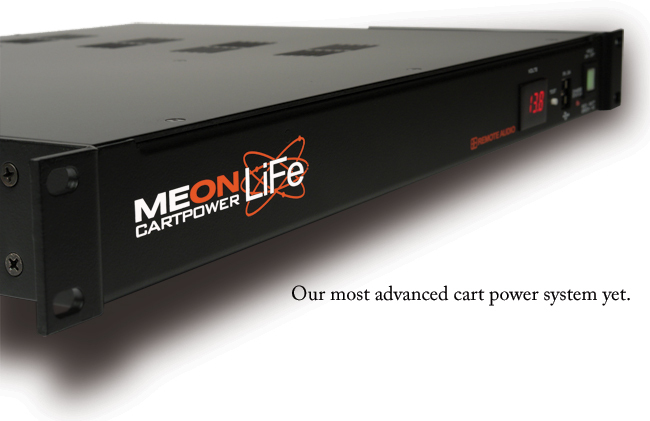 This relatively new battery technology makes the Meon LiFe smaller, lighter and more stable than previous cart power systems. External lead-acid batteries or Extra LiFe battery packs can be connected to the Meon LiFe to increase the battery run time of the system. The three-stage internal battery charger automatically charges these batteries whenever AC power is present. The illuminated voltmeter on the front panel gives you constant feedback of the voltage present at the output connectors. The charge status LED indicates when the batteries are fast charging (red), topping (flashing green) or fully charged (solid green). When the Meon LiFe is off, pressing the Test button will display the voltage of the battery. The removable rack ears can be used to mount the Meon LiFe in a variety of different configurations. Mirrored, illuminated front and rear power switches allow you to power the unit on or off from either side. The Meon LiFe also comes equipped with a Remote Port to connect an RM or RS (sold separately). Convection cooling prevents the need for noisy internal fans. Automatic 10V cutoff circuit protects external lead-acid batteries from over-discharge. Internal battery can be fully recharged in 3 hours or less. The complete system weighs less than 13 pounds. * 14A with Meon LiFe alone; 18A with optional “Extra LiFe” battery module. 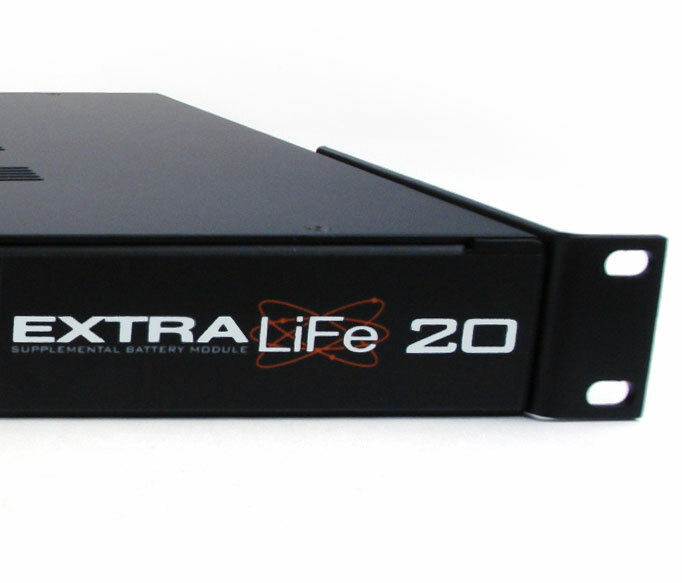 The Extra LiFe 20 supplemental battery module contains a 20Amp-hour Lithium Iron Phosphate battery and is designed for use with the Meon LiFe cart power system. The Extra LiFe 40 supplemental battery module contains a 40Amp-hour Lithium Iron Phosphate battery and is designed for use with the Meon LiFe cart power system. The RM displays voltage and current draw and acts as a remote ON/OFF switch. The RM also includes a low battery indicator. The Juicer provides a regulated 15VDC output from an input voltage of 9-18VDC. A variety of 4-pin XLR DC power cables for use with the Meon line of power products. Remote Audio is offering an ​optional ​update for all Meon LiFe units manufactured before March ​, 2015​. U​pdate involves improved performance and stability​ in most situations. Parts​, installation and shipping charges are at customer’s expense. ​Upgrade pricing to be quoted upon product inspection. Service will be performed at Remote Audio’s main office in Nashville, TN. If you are interested in getting the update, please contact our main office first for a Return Authorization number and further information. You can contact us at 615-256-3513 or [email protected]. Please have your unit’s serial number ready when you contact us. It is possible to have unwanted audible noise induced into audio systems by a common (shared) power source. To optimize your system, it is recommended to use line level signals instead of mic level signals whenever practical. Also, turn phantom voltage off of all preamp inputs that are connected to non-microphone devices. If noise is still heard, unplug one device at a time from the Meon, noticing any change in noise associated with the removal of each device. If the noise goes away after unplugging a particular device, try powering that device with a separate battery. If using a separate battery causes the noise to go away, then the problem is a ground loop associated with the combination of a common power source and audio grounding schemes. Be aware that this noise will not be removed with “LC” filters found in some cart power supplies. Use a separate battery for the offending device. Try different grounding/floating schemes with the audio cables. 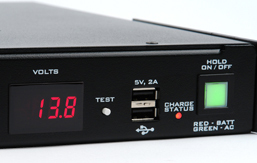 In devices that use a single 9V battery, use an isolating 9V battery eliminator such as those made by Lectrosonics. Does the Meon LiFe use fans? No. The Meon LiFe was designed to use convection cooling since it’s primary function is powering sound recording equipment on sets. Even the slightest hum of cooling fans cannot be tolerated on a very quiet sound stage. When using AC power, it is best to mount the Meon LiFe with some free space above the chassis to allow proper cooling. The Meon LiFe has vent slots in the sides of it’s chassis which must remain unrestricted during operation to further facilitate cooling.